Hint #1: CNE stands for Computer Network Exploitation. It refers to espionage and reconnaissance operations. These are conducted to steal data from a system or simply to obtain intelligence about networks, to understand how they work and are configured. Hint #2: The slide presentation dates from 2011, two years before the famous events of 2013. Disappointment: I don’t know for sure who the author is. I thought it was Edward Snowden, but the article below drew me in. 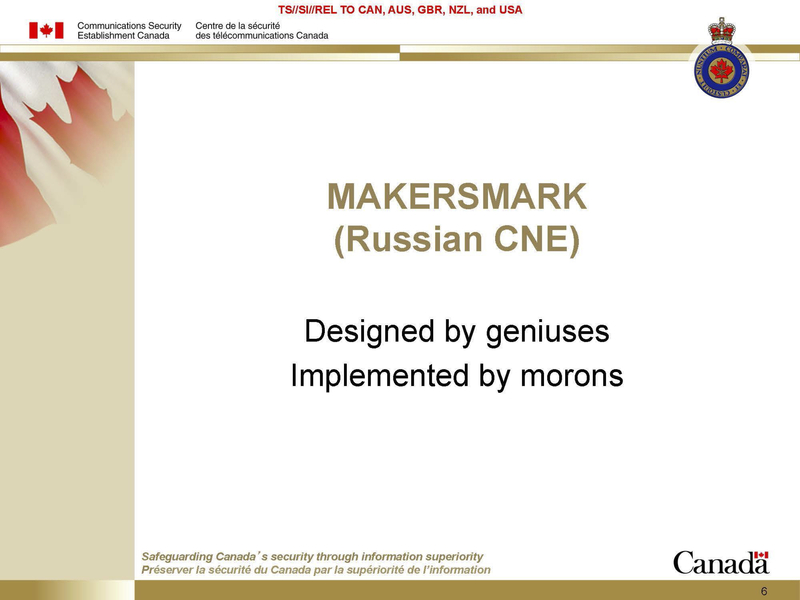 Well, the language and spirit are Snowden’s, so I’ll pretend Snowden wrote it, even though the presentation came from Canada’s Communications Security Establishment! On the question of why the jokers who hacked the DNC did not seem to care that much if people in the target country knew who they were: if you hacked the DNC, wouldn’t you want people to know who you are? I don’t want to over-speculate about this question – I don’t the evidence – but these guy do not seem to have been professionals. They seem to have been free-booters favored with Russia’s best technology. Hackers live for bragging rights. Professionals crave anonymity. Snowden was a professional, until he realized he was working for a criminal organization. He became a spy because he was a patriot, not because he wanted to go into organized crime. When he saw how our spy agencies actually operated, anonymity was not so important to him. So he revealed how far NSA had gone to violate the law. To return to the 2016 election: we’ve had more than a year now to get a feel for what happened on the other side of the cyber-wars. We can only guess, though, because we are never going to learn from our own intelligence agencies how they reached their conclusions about Russian meddling. The slide presentation and The Intercept article, along with a lot of news reports from 2016, do give a few hints about what happened. Let’s consider those speculations later, though, as this article is long enough! My remark about free-booters above gives you an idea where I’m headed.